The Tre Kronor series is truly a knife for the stylish person and is definitely not for the faint hearted. Combining sleek and beautiful design with first class engineering and incredible versatility, the TK1mml also comes in a lovingly designed Micarta handle which adds to its appeal. It is a pity that Fallkniven do not intend to continue this knife model after stock runs out, but this makes it all the more desirable as a collector’s item. 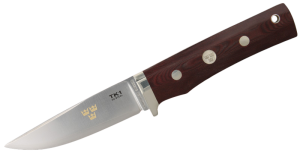 The TK series can be described as a knife which has the best technological features which is fantastically combined with a Swedish design that is timeless. The blade compound has resulted after an incredibly laborious and painstaking process which offers a blade in 3G steel which is laminated and which has powder steel on its edge. Fallkniven have added an incredibly tough steel which also does not corrode and which provides great stability to the hard centre. The result is a blade which is extremely strong and rigid but which also keeps its edge perfectly. The TK1mml is a typical design that holds to the minimalist creed and the result is a knife which combines several characteristics but which principally makes it easy to use and very accommodating indeed. If you want to spoil yourself with a knife that is different and truly functional then you should look no further than the TK1mml. What with the incredible strength offered by the laminated powder steel and the fact that the knife is painstakingly made by hand by hugely experienced craftsmen, you really cannot go wrong with the TK1mml.